David Shorter, a local Ramsgate resident, founded Beach Within Reach in 2006. While on holiday in Great Yarmouth, he saw one of the Landeez All-Terrain wheelchairs and thought it would be the perfect chair for a friend of his to use to enable his disabled sister to access the beach at Ramsgate. On his return to Thanet, he got together with a small group of friends and set about raising the money to get a wheelchair or two for Ramsgate Beach. Initial donations from Kent County Council and the Ramsgate Charter Trustees ensured the charity could become registered in 2007. Over the following year a huge amount of money was raised. Pfizers and the Rooney Foundation made large contributions and the charity was able to purchase a total of 18 chairs direct from the manufacturer in California. Although Mr Shorter is no longer involved with the charity, Keith Mannering, one of the original trustees, still is. He, along with 2 other trustees, Pauline Longman and Debbie Fifield, currently manage the day to day running of the charity. A handful of volunteers, the Your Leisure Bay Inspectors and donations from the general public, businesses and organisations all contribute to making the service possible. With the help of social media, more and more people are becoming aware of Beach Within Reach and the wheelchairs availability. 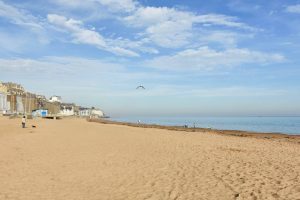 People living in Thanet, visitors to the area and local businesses all benefit from having the wheelchairs on the beaches. They are used frequently by schools, care homes and organisations to help them provide more accessible days out to all. There is also a chair in the Ramsgate Tunnels. Being All-Terrain means the wheelchairs make any type of uneven surface easier to traverse, and away from the beaches the chairs can be used in the countryside and woodlands, even on a pebble beach. There is one main issue which prevents us being available to everyone, we currently do not have a hoist facility. This is something that we are in the process of changing, so please look out for updates. There are also some problems with the general accessibility to a few of the local beaches, especially those that are very steep. This is one of the reasons the wheelchairs are not available on every beach. We will try to help whenever we can and do our utmost to make life a little easier for you even if it’s only for an hour or two. You will never be charged for the use of our wheelchairs, the local beaches are a free leisure facility for all to use. We do, however, rely on donations to enable us to continue to offer this service to those that need it both now and in the future. Please see our Donate page if you would like to make a contribution.